MANHATTAN, Kan. - A 13-game homestand during the month of March and 29 games against 2009 NCAA Regional competition highlight Kansas State’s slate as head coach Brad Hill released the Wildcats’ 2010 baseball schedule on Thursday. Kansas State will play 28 home games, while the Wildcats face 10 squads that advanced to the previous year’s NCAA Tournament for the third-straight season. Of the Cats’ 29 games against 2009 NCAA Regional participants, 14 come within the final month of the regular season. The 2009 season opens on Friday, Feb. 19, at The Citadel Memorial Challenge against Delaware. The Cats then face East Tennessee State on Saturday before taking on the host school, The Citadel, on Sunday. K-State will then stay in Charleston, S.C., to face the Bulldogs for an extra game on Monday, Feb. 22. Kansas State travels to Florida to play eight games in nine days, beginning with the Russmatt Central Florida Invitational at Chain of Lakes Park – the former spring training home of the Cleveland Indians – in Winter Haven, Fla. The Cats will play five games in the invitational, which runs Saturday, February 27 through Wednesday, March 3. K-State will play against a combination of teams in Duquesne, Illinois State, Maine, Northeastern, St. Bonaventure, Valparaiso, Villanova and Western Michigan. The exact schedule for the tournament will be released at a later date. Following a day off on Thursday, K-State will participate in the Bright House Invitational, hosted by Stetson, beginning Friday, March 5, in DeLand, Fla. The Wildcats will face the Hatters on Friday before squaring off against Notre Dame on Saturday. Kansas State will finish its Florida excursion and 12-game road trip to start the season on Sunday against Harvard. The 12-game road trip is the longest to start a season since 1972. Kansas State will open its home slate with season-long 13-game homestand beginning on Friday, March 12, against Kent State. The Cats continue their series with the Golden Flashes with a Saturday doubleheader at 12 p.m., while the series finale is scheduled for Sunday at 1 p.m. Following a home contest against Creighton on Tuesday, March 16, the Cats will play another four-game weekend series beginning on Friday, March 19, against UW-Milwaukee. 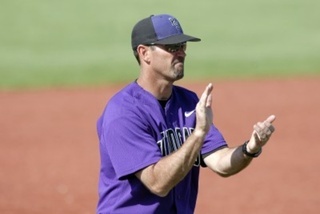 The season-long homestand also sees the start of Big 12 play for Kansas State as the Wildcats welcome Oklahoma State to Tointon Family Stadium for a three-game series beginning Friday, March 26, at 6:30 p.m. The homestand and the month of March concludes with a visit from in-state rival Wichita State on Tuesday, March 30. K-State’s first conference road trip is to Lubbock, Texas, as the Cats face Texas Tech, April 1-3, before coming home to take on Nebraska, April 9-11. K-State, which traveled to BYU two years ago and played the Cougars last season in Manhattan, will travel to Provo, Utah, for a two-game series against the Mountain West Conference school on April 13 and 14. Following a three-game home conference series against 2009 NCAA Regional participant Baylor, April 16-18, the Cats travel to Eck Stadium in Wichita to conclude their season series against the Shockers on Tuesday, April 20. K-State will then stay on the road as it travels to Columbia, Mo., to face Missouri, April 23-25. The Wildcats will face Chicago State, Tuesday and Wednesday, April 27 and 28, in Manhattan, before traveling to Oklahoma to end April and begin May as they play the Sooners Friday, April 30, through Sunday, May 2. The final stretches of the season see Kansas State at home for seven of its final 11 games. The Wildcats will step out of conference play for the final time in 2010 as it hosts 2009 NCAA Regional participant and Big Ten member Minnesota, Tuesday and Wednesday, May 4 and 5. College World Series runner-up Texas comes calling for a three-game weekend series in Manhattan beginning Friday, May 7. The Cats will renew their in-state rivalry against Kansas beginning Friday, May 14, in Lawrence, before the series shifts to Manhattan for the Saturday and Sunday contests. The Jayhawks are another 2009 NCAA Regional team. Kansas State’s regular season concludes in College Station, Texas, with a three-game series at Texas A&M, beginning Friday, May 21. The 2010 Big 12 Championship will be conducted May 26-30 at Bricktown Ballpark in Oklahoma City, Okla., while NCAA Regionals will run June 4-7 at 16 various on-campus sites throughout the country.